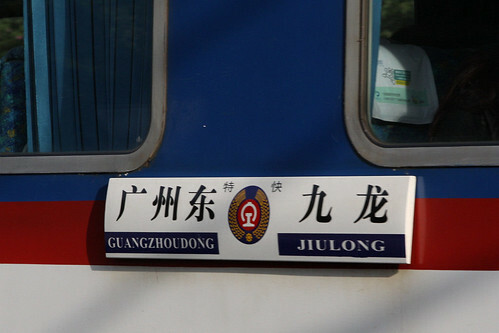 The destination of a Chinese train can be determined by the signs hung on the side of each carriage: the boards get swapped over at the end of the line, so the station names are in the correct order – another little bit of busy work. This train is bound from Guangzhou to Hung Hom: the Chinese names are “Guangzhoudong” and “Jiulong” (Kowloon). Four classes of travel exist: “hard seat”, “soft seat”, “hard sleeper” and “soft sleeper”. The soft and hard names don’t describe the quality of the seat or sleeping berth, but the travel class: being equivalent to first and second class respectively. For a Communist country where everyone is supposedly equal, calling it “first class” wouldn’t be very proletarian, would it? All carriages have a nice big code board at each end of the body – this is carriage “RZ25Z 110627”. RZ is the type of carriage – ruanzuoche (“Ruan Zuo Che”) translates as “soft seat carriage”. 25Z is the class of carriage design – Class 25Z in this case. 110627 is the carriage number. This ends my quick guide to Chinese railway carriages: coming up are articles on the 25Z and 25T class carriages that cross the border into Hong Kong. This entry was posted in Transport and tagged carriage, China Railways, Hong Kong, railway, trains. Bookmark the permalink. Does all hard Sleeper carriage also have Air Con?